Craig enjoys the splendor of No-Name Ridge. 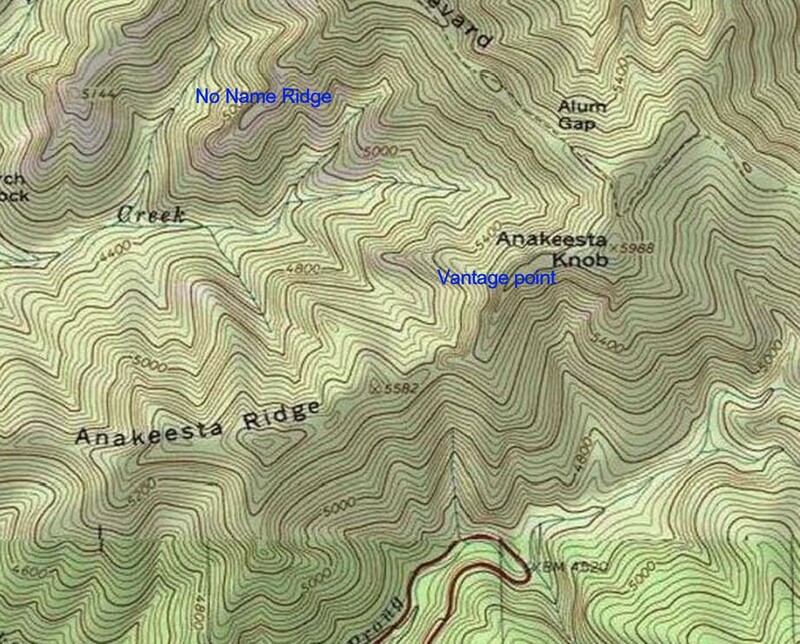 Last weekend I viewed the different approaches to No-Name Ridge from Anakeesta Ridge. Yesterday a group of us climbed up to No-Name, but by a different route than the one I’d intended—not a bad one, though. Our party consisted of myself, Craig Hutto (who will be my co-leader on the July 20 outing for the Smoky Mountains Hiking Club), Greg Hoover, Chris Sass, and Clayton Carver. 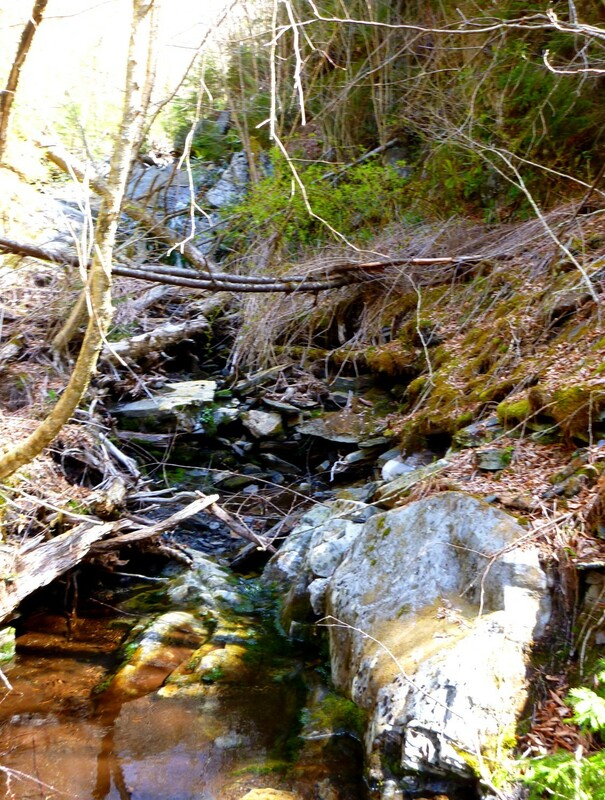 I was so busy negotiating the stream that I didn’t take photos along the way. I didn’t wade through any deep pools but felt free to step on rocks an inch underwater. I did end up accidentally going knee-deep in one spot! 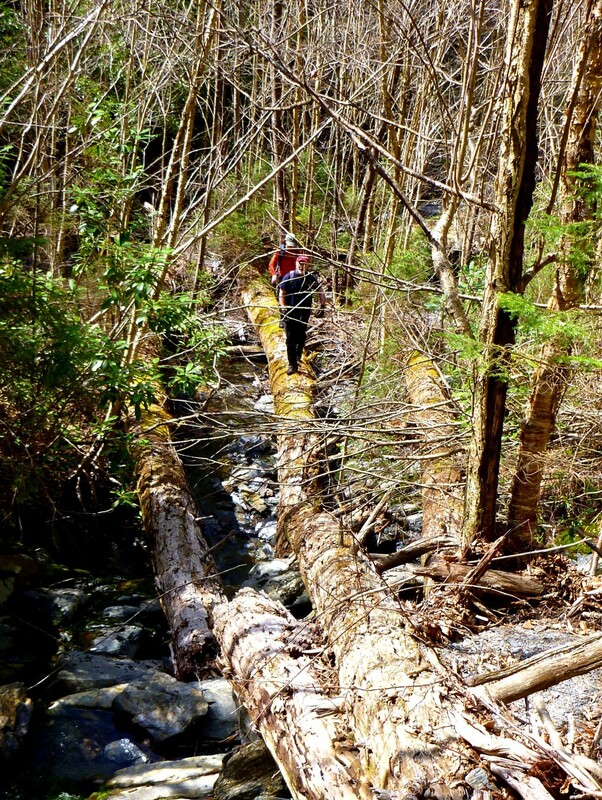 Greg and Chris walk across a fallen log. 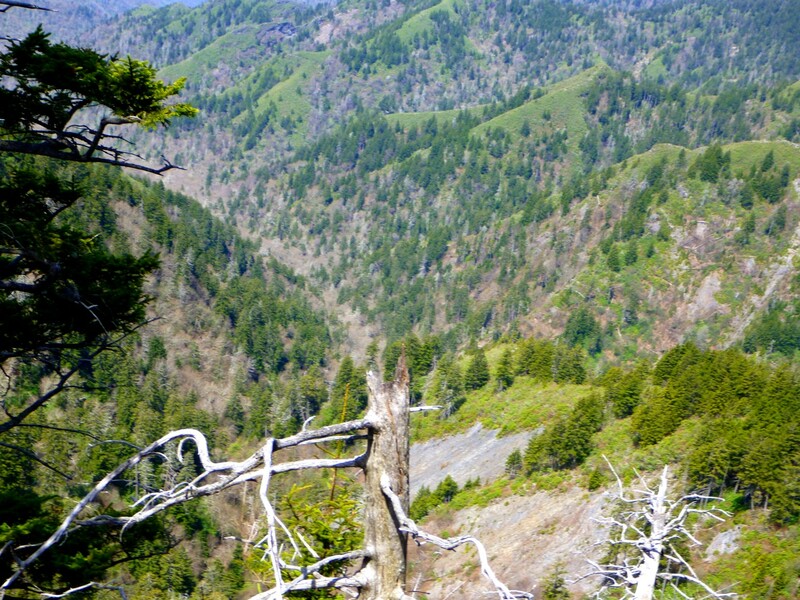 The idea was to get up to a stream junction around 4560′ and look for the bottom of a Y-shaped landslide scar. I took this photo of the slide last weekend from Anakeesta Ridge. When we reached that section of the stream, things got complicated. We saw minor logjams and water that had a reddish discoloration from disturbance of sulfuric Anakeesta bedrock. 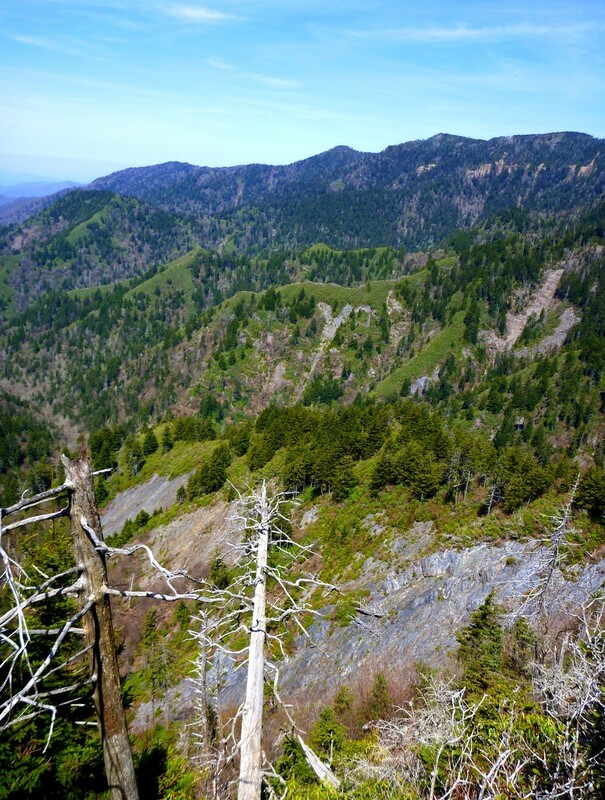 Within a very short distance, we found several places where slides had come down. The one we picked turned out to be past the correct route, the Y-shaped scar. But it was a fun way to go, alternating between Anakeesta slabs and patches of vegetation that weren’t too bad. The bottom of our route. 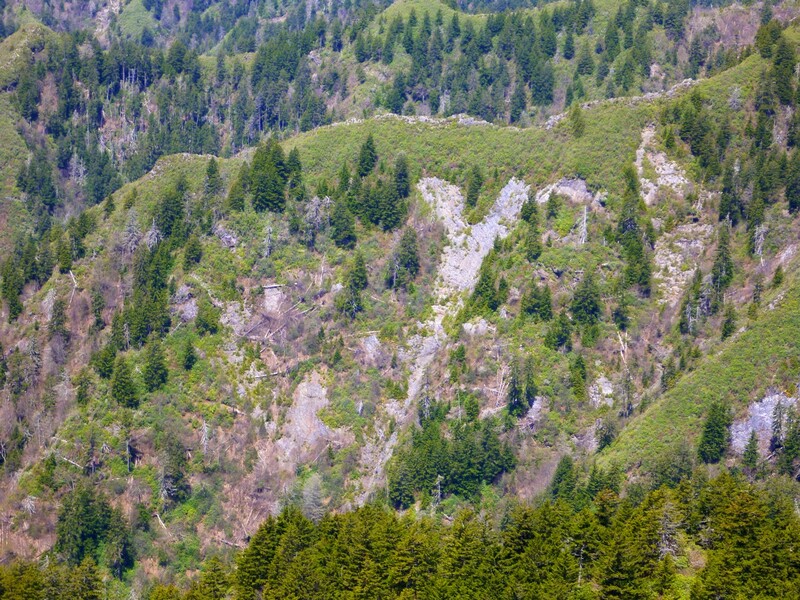 When things didn’t open up into a completely bare landslide area, we realized we’d missed the Y-shaped scar. But we couldn’t see it from where we were, and traversing across looked as though it would take us through a tangle of briers and laurel. Plus, the way we were going seemed pleasant. Hoover climbs up one of the open slabs. Clayton relaxes in the sunshine. Before long we reached the ridgecrest. 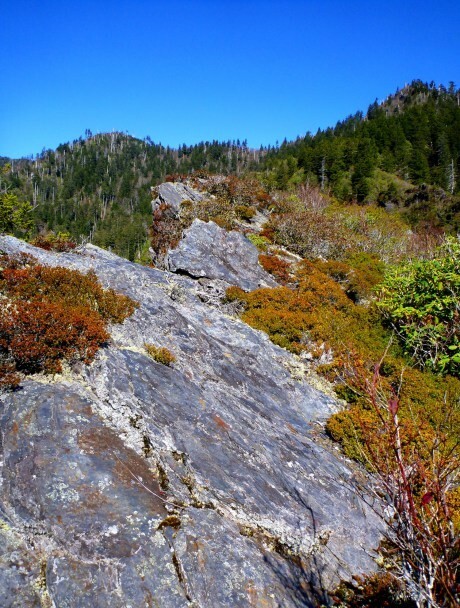 Because our route had gradually angled eastward, we reached the ridge above the spectacular open area. 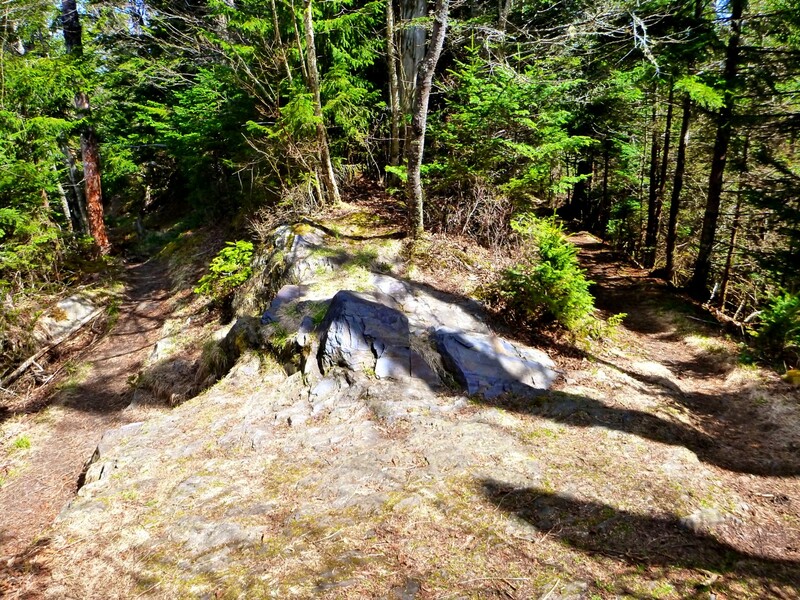 So we downclimbed and scrambled over the fun rock spine with its little ups and downs. We found a great spot to stop for a break, and by closely examining the photos of the ridge I’d brought along, we determined that the Y-shaped scar was probably directly below us—though it couldn’t actually be seen, because of the belt of heath immediately below the ridgecrest. 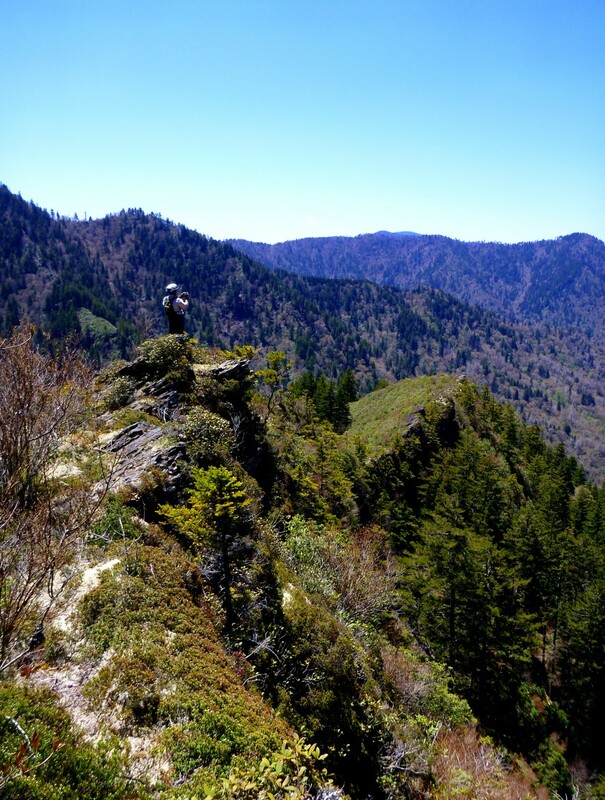 Some folks wanted to drop down to confirm the location of the slide, while others wanted to continue with the original plan, to go up the ridge to the Boulevard trail and over the top of LeConte. Since my co-leader preferred to go down, and Hoover had some surveyor’s tape with him, I was happy to let them take the much shorter route back down as long as the departure point for the Y-slide could be clearly identified. 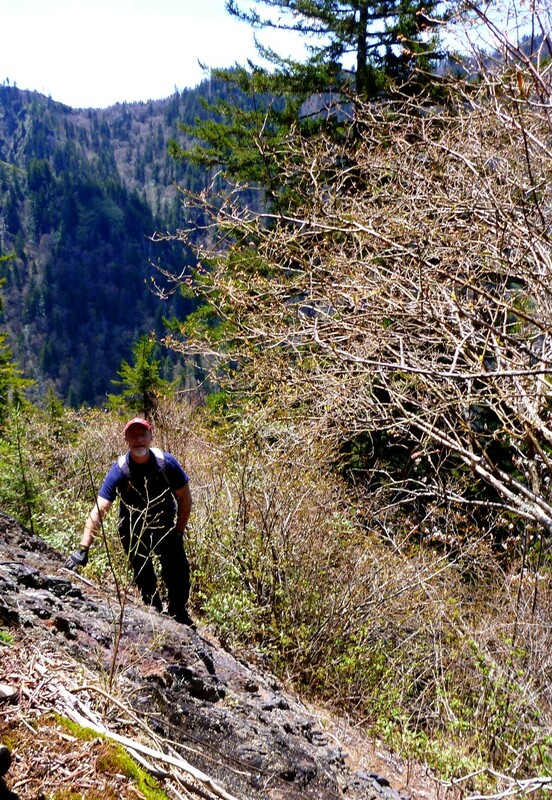 Chris and I continued upward while the other three went back down to the stream valley. And they did indeed find that the Y-slide was just below. The upper section of No-Name is long, steep, and brushy, so it took Chris and me a while to get up it. 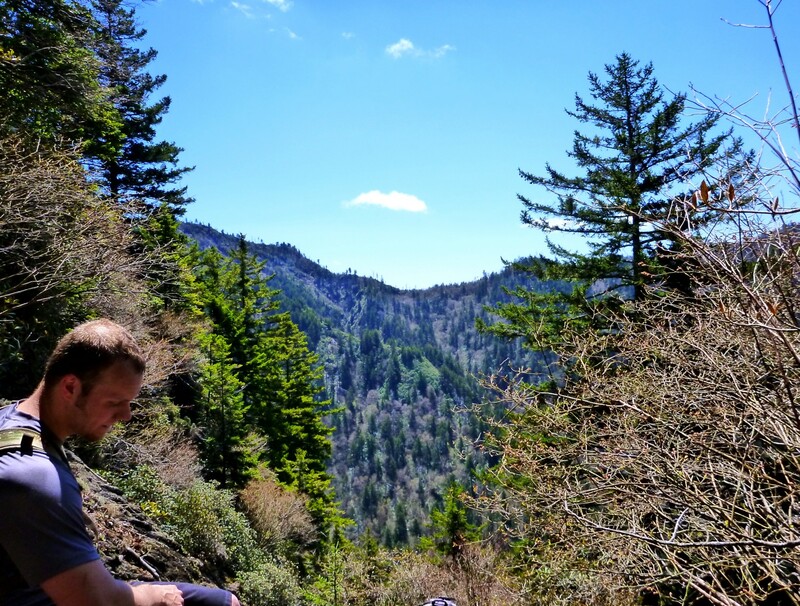 But we eventually popped out onto the trail and sat for a rest, while passing hikers noticed our disheveled condition and assured us “it wasn’t much further” and so on, obviously having no idea of the route we’d taken to that point. So, we are now all set to take any experienced off-trail hikers up the Y-slide on the SMHC outing in July. 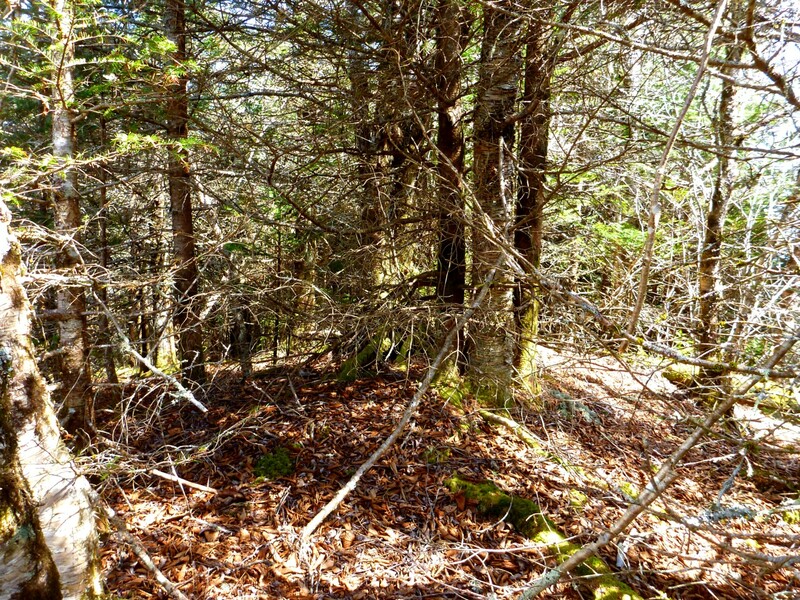 And we will remove the surveyor’s tape as we go—I always hate to see tape left in the woods. No-Name spine. Chris and I climbed over the knob at upper right. 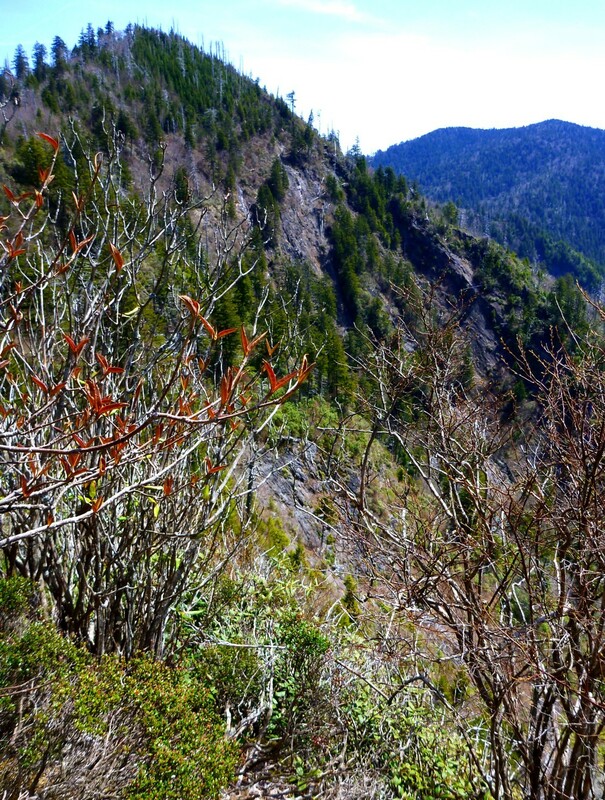 Heath-covered ridges and mighty LeConte. There was a method to my madness. I needed to get a good view of the landslide scars on No Name Ridge. And what is the best vantage point for that? Upper Anakeesta Ridge. I looked across the upper valley of Alum Cave Creek. 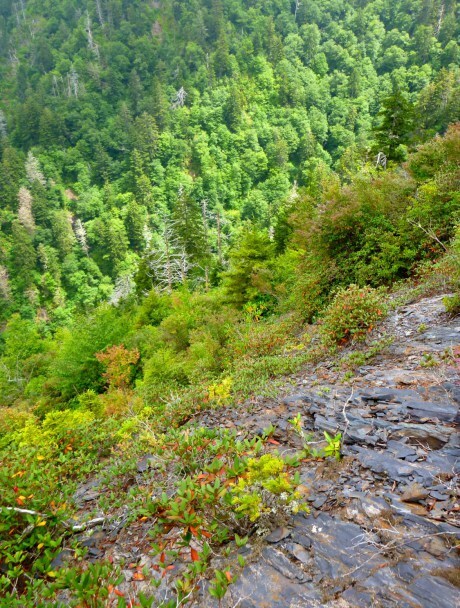 On July 20 I will lead an outing for the Smoky Mountains Hiking Club up Alum Cave Creek to the crest of No Name and then on to the Boulevard trail and over LeConte to return to our starting point at the Alum Cave trailhead. I’ve been up No Name before, but the route I took up the side of the ridge wasn’t ideal. It would be best to follow one of the scars, thereby postponing the inevitable crawling through the heath until close to the top. It’s possible to reach my vantage point several different ways. 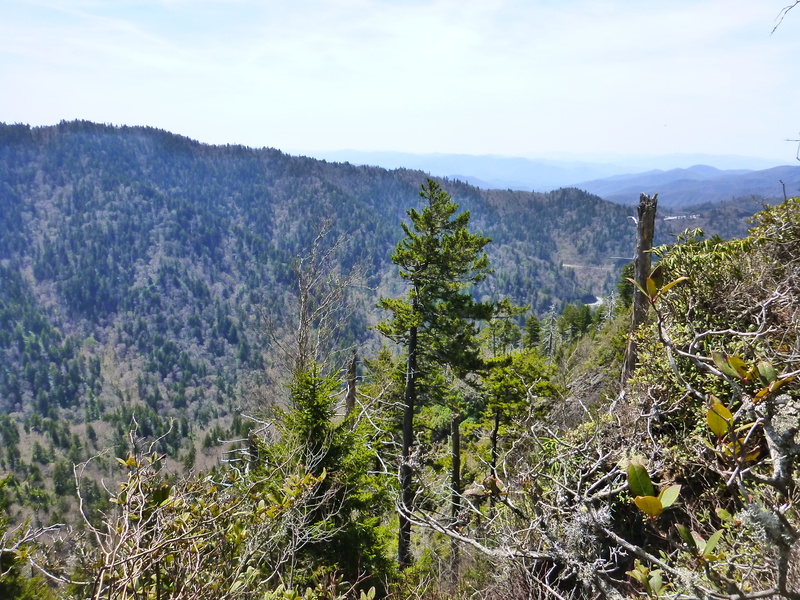 I took the easy way: hiked out from Newfound Gap to the Boulevard trail, and then bushwhacked the short distance over the top of Anakeesta Knob and down the ridge until things opened up. Then I retraced my steps. I figure the trail mileage was about 9 or 10 roundtrip. The place where Anakeesta Ridge hits the trail was familiar to me, as it is essentially a continuation of the Shutts-Boulevard divide ridge on the other side of the Boulevard. A piece of that ridge was part of my marathon outing up Shutts Prong last August. The trail makes a sharp little turn where it crosses over the “Anashuttsevard” ridge. Intersection of Boulevard trail with the ridge. 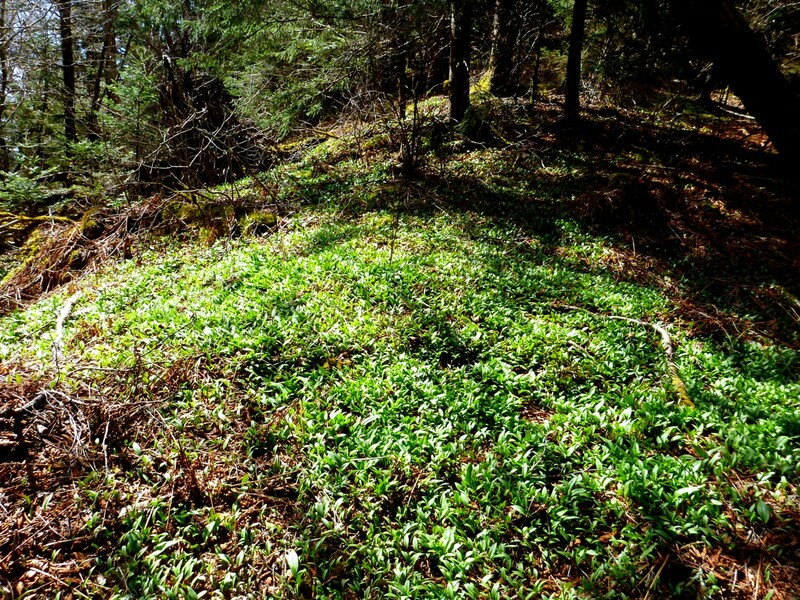 I walked through fairly open woods, through glades filled with trout lily foliage. None were blooming, but the foliage was pretty. Before I knew it (whatever that expression means), I had reached the summit. The not-very-exciting summit of Anakeesta Knob. 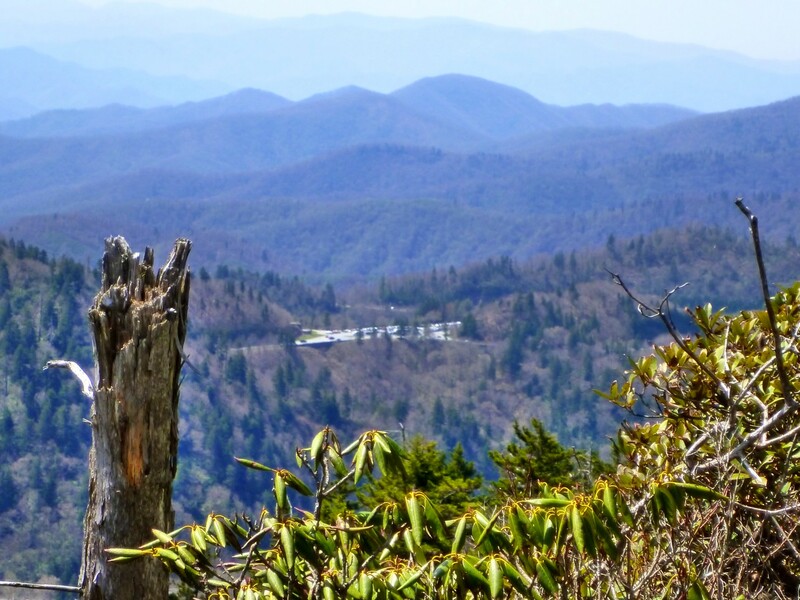 As I descended off that fearsome cone, I had a view of the parking lot at Newfound Gap. It seemed just a stone’s throw away (since I seem to be using hackneyed expressions). A telescopic view made the stone-throwing even easier. 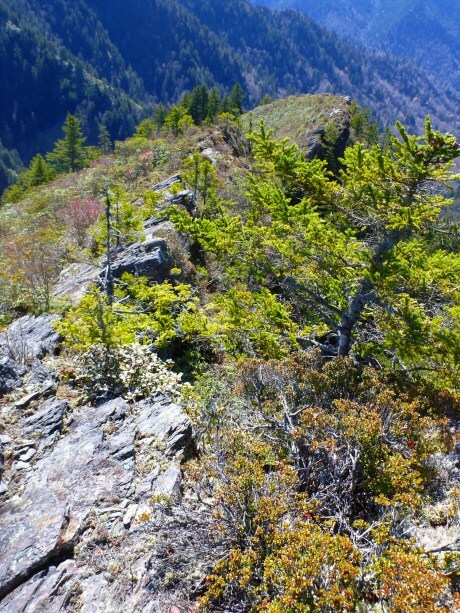 The ridge had clearly been traveled by bears and by bear-like humans—I know who the usual suspects are. The narrower the ridge, the clearer the path. I had a great view down the Alum Cave Creek valley. Valley of Alum Cave Creek. And, looking off the other side, across the valley of Walker Camp Prong. I could practically see all the people hiking the A.T. The view back to the Knob showed me that not all approaches are easy. The Knob shows its more dramatic side. I pushed along until I reached some dense heath, then went back to my best vantage point and stopped for lunch. I took a telescopic picture of the slides on No Name. It seems to me the side of the ridge is more bare than it used to be. Perhaps some of the slides were enlarged during last year’s heavy rains. If you look closely, you can see how the spine of the ridge has a rock backbone, which is what makes it such a great place. The Y-shaped slide looks like the way to go (click for zoom). A pleasant outing on a beautiful spring day. 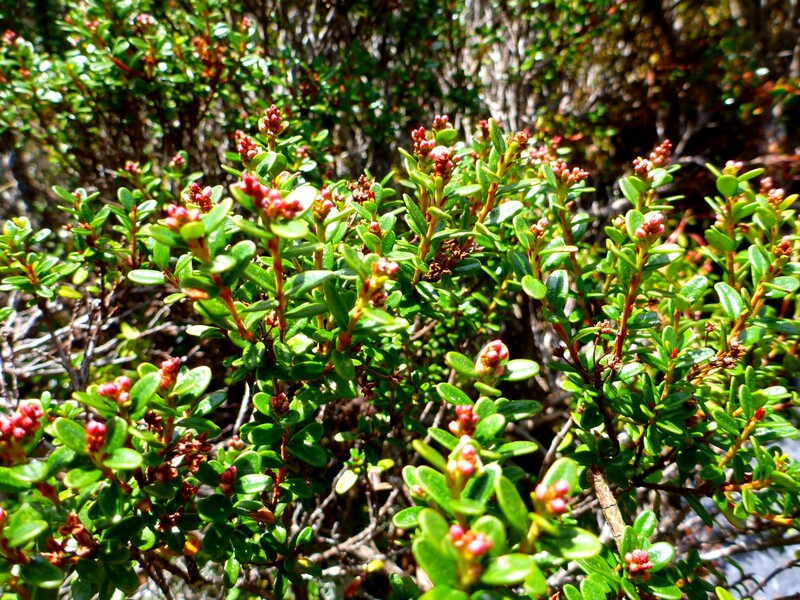 The myrtle is full of buds. Toward the western side of Anakeestaland: Trout Branch Scar. 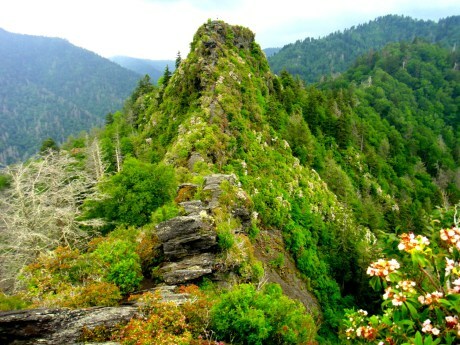 Deep in the heart of the Smokies lies a realm called Anakeestaland that for some reason doesn’t show up on the map. 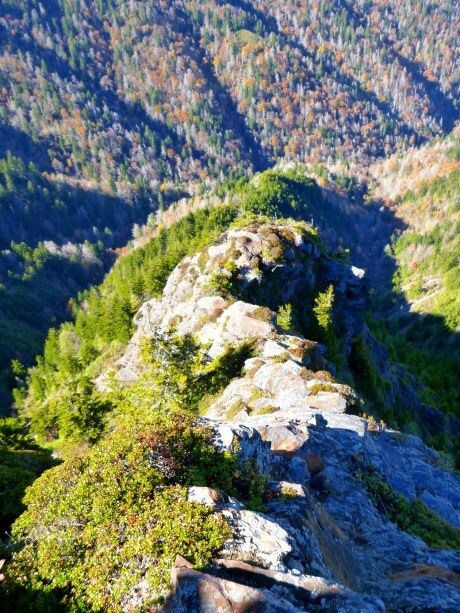 Roughly speaking, it extends from the Chimneys to Eagle Rocks—but only at the higher elevations. You have to work upward through the sandstone regions to get there. In Anakeestaland you find a certain combination of things: tidy cushions of sand myrtle, aromatic Rhodo minus, the green-striped Grass of Parnassus. The peregrine falcon chooses to live here. The Chimneys are located in Anakeestaland. Anakeestaland collects violent storms. 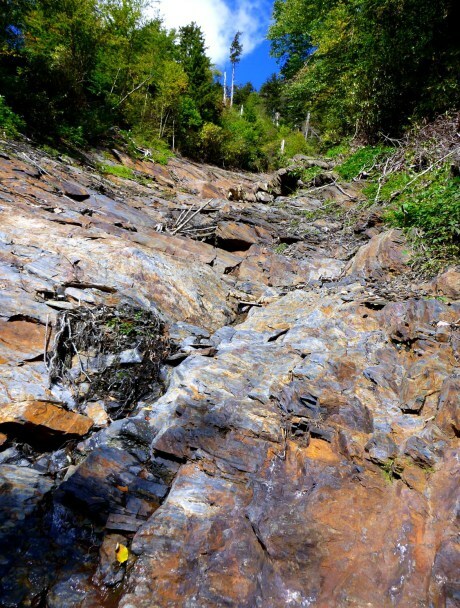 Catastrophic downpours rearrange things periodically, scouring out the side valleys, shoving piles of fractured rock downstream and snapping off big trees. In the logjams at the bottom, treetrunks have been twisted and the bark stripped off, ragged strips of fibrous wood have been peeled back. Climbing upward, you pass through the regions of smooth sandstone and cross the boundary line into brittle, angular rock that makes good handholds—if the grain runs horizontally. Where it runs vertically, the going is more difficult. Anakeesta with vertical grain near Shutts Prong. For anyone who spends time scrambling over these rocks, the sandstone and the Anakeesta develop distinctive personalities. 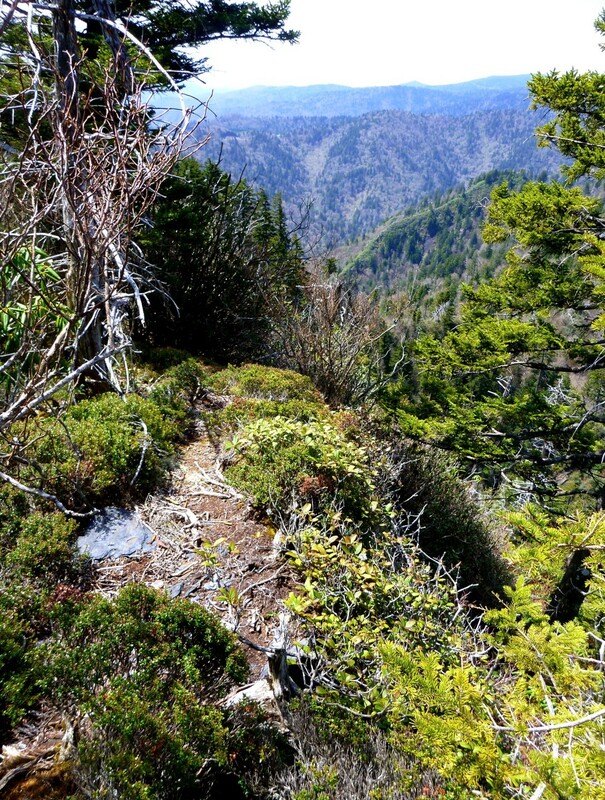 In keeping with the typical profile of Smokies slopes, the climbing gets steeper in Anakeestaland. Things mysteriously intensify. In the upper crags of Anakeestaland. So many times I have made that journey and crossed that frontier into the high, challenging, beautiful realms. The ridge with the paradoxical name of No Name.